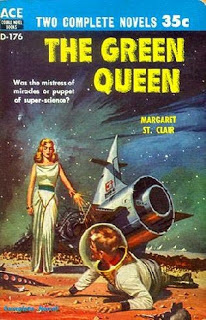 The Green Queen was Margaret St.Clair’s first published novel. Although it was issued in 1956 as part of an Ace double book (paired with Three Thousand Years), the novel first saw publication in 1955 in shorter form as Mistress of Virdis. It readily falls into her golden age SF period of writing. 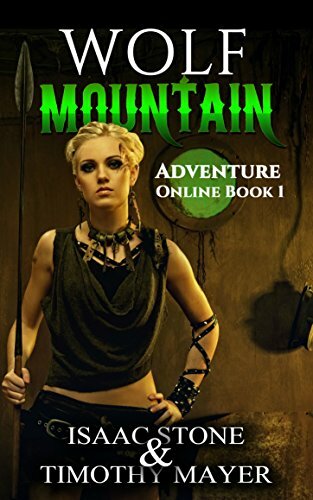 Green Queen takes place in the far future on the planet Viridis. It exists in the same continuum as St.Clair’s The Games of Neith. Both books reference the migration of the worshipers of Jovis and their battle cry of “Jovis is a first class god!” There’s even some reference to the same Chinese furniture in Neith. It would be interesting to know if she was working out some sort of future history. Two hundred years before the novel begins, Viridis was settled by a man named James Renfrew and his Jovian followers. Later, a man named Jensen attempted to lay-out suburban tract housing all over the planet,but both failed to account for the high level of background radiation. Once the settlers began dying in large numbers, people begin moving to cities which were protected by anti-radiation barriers. As time passed, the populace evolved into two classes: The “uppers”, who live in the splendid higher regions of the urban environment, and the “lowers”, who exist at the bottom levels, where life is brutal and short. The best any lower can hope for is to be hired as a body-servant and move “up the stairs”. The novel opens with mask-maker Bonnar trying to figure out what sort of rumor to spread to the lowers to keep them in line. He’s part of a secret service which creates Veridical Masks (i.e., 3D images) for control of the lowers. He decides on propagating a legend of “The Green Queen”, a universal savior who will purify Virdis and lead the populace to salvation. Years before Frank Herbert wrote of the use of messianic figures as propaganda in Dune, Margaret St. Clair was thinking along similar lines. After using a sorting machine known as an ibim (as usual in St. Clair’s novels, technical devices are a given and not explained), Bonnar selects two candidates to play the role of the Green Queen in his latest mask. The first is Leaf Amadeus, an apprentice mask-maker and an immigrant from Earth. The second is Caroline Augliner, an embroiderer. Neither are married. Bonnar arranges a field trip outside the capitol city of Shalom to examine the ruins of the abandoned settlements with Leaf and a historian named Horvendile. This is the most fascinating part of the book as it gives the reader some insight as to how St. Clair felt about suburbs. Although abandoned for hundreds of years, the tract housing is perfectly preserved. There are even small domes in some of the back yards where the original settlers tried to protect themselves against the radiation. During this trip, Bonnar witnesses Leaf slipping into the role of the Green Queen unconsciously. Later, the uppers discover Leaf is being hailed as the Green Queen all over the city. Bonnar and his band try to coach the other candidate, Caroline Augliner, in the role of the queen. But nothing goes as planned and soon the entire planet is in the grip of religious fury. An excellent example of St.Clair’s writing from her most productive period.